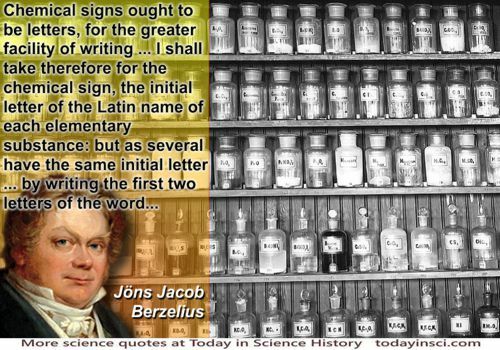 Swedish chemist who was one of the founders of modern chemistry. He is especially noted for his determination of atomic weights, the development of modern chemical symbols. Die Gewohnheit einer Meinung erzeugt oft völlige Ueberzeugung von ihrer Richtigkeit, sie verbirgt die schwächeren Theile davon, und macht uns unfähig, die Beweise dagegen anzunehmen. 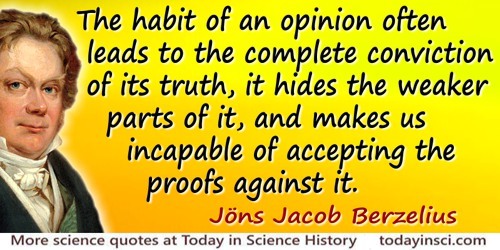 The habit of an opinion often leads to the complete conviction of its truth, it hides the weaker parts of it, and makes us incapable of accepting the proofs against it. (1827). German text in Ira Freund, The Study of Chemical Composition (1904), 31. Translated form in Carl Schorlemmer, The Rise and Development of Organic Chemistry (1894), 49. 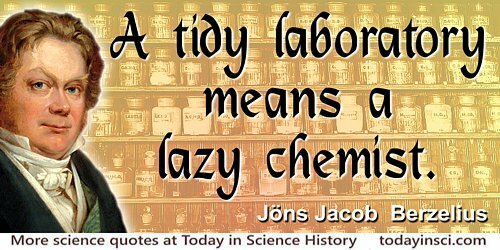 A tidy laboratory means a lazy chemist. Berzelius to Nils Sefstrom, 8th July 1812. In C. G. Bernard, 'Berzelius as a European Traveller', in E. M. Melhardo and T. Frängsmyr (eds. ), Enlightenment Science in the Romantic Era (1992), 225. In arranging the bodies in order of their electrical nature, there is formed an electro-chemical system which, in my opinion, is more fit than any other to give an idea of chemistry. Essai sur le théorie des proportions chimiques (1819). 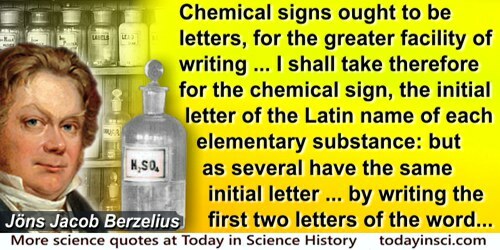 Translated in Henry M. Leicester and Herbert S. Klickstein, A Source Book in Chemistry 1400-1900 (1952), 260. Since it is necessary for specific ideas to have definite and consequently as far as possible selected terms, I have proposed to call substances of similar composition and dissimilar properties isomeric, from the Greek ίσομερης (composed of equal parts). Jahrebericht (1832). As translated in Henry M. Leicester and Herbert S. Klickstein, A Source Book in Chemistry 1400-1900 (1952), 265. The experiments made on the mutual electrical relations of bodies have taught us that they can be divided into two classes: electropositive and electronegative. The simple bodies which belong to the first class, as well as their oxides, always take up positive electricity when they meet simple bodies or oxides belonging to the second class; and the oxides of the first class always behave with the oxides of the other like salifiable bases with acids. 20 Aug - short biography, births, deaths and events on date of Berzelius's birth. 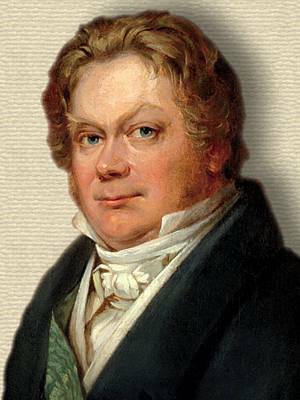 Jöns Jacob Berzelius: Autobiographical Notes, by H.G.Soderbaum and Olof Larsell (trans). - book suggestion.